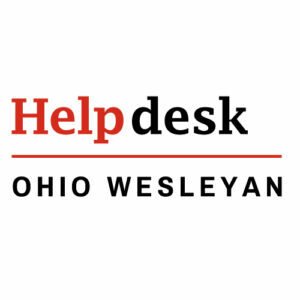 Ohio Wesleyan’s Virtual Private Network (VPN) is available for staff and faculty who need access to the University’s network while working off-campus. These instructions are for all versions of Mac and Windows. Note: there is a known issue with Firefox warning that the certificate encryption level is too low. This warning does not appear in other browsers, and you’ll still be able to download the client. You may also now see this warning in Chrome. Try another browser. 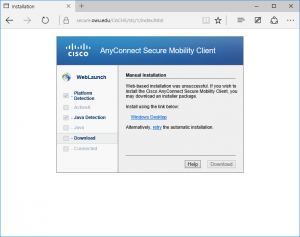 The site will detect your OS and system configuration and provide a link to download the correct Cisco AnyConnect Secure Mobility Client for your Operating System. 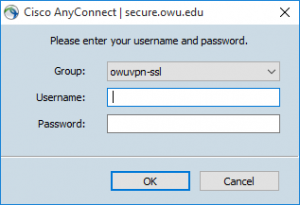 Click the link listed, “Windows Desktop” in this example and install the VPN client application on your computer. 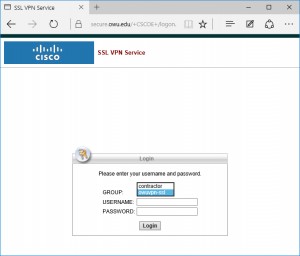 There is a Cisco AnyConnect app available for iOS.